This dish is perfect for fall – rich, hearty, and full of pumpkin flavor. If you’re not a pumpkin lover, feel free to substitute butternut squash. Prepare it exactly the same way as the pumpkin; it also compliments the sage. I recommend preparing the pumpkin at least a day before you want to serve the lasagna – that way the dish will come together quickly and feel less daunting. You can also make this dish vegetarian by omitting the sausage. Because this lasagna is so rich, I suggest serving it with a salad simply dressed in a mustard-based dressing. If you don’t have one you love, try a teaspoon of course mustard, about 2 teaspoons of red wine vinegar, and combine with salt and pepper. Drizzle in good extra virgin olive oil – about 2 tablespoons – until you have a dressing. Preheat the oven to 350º. 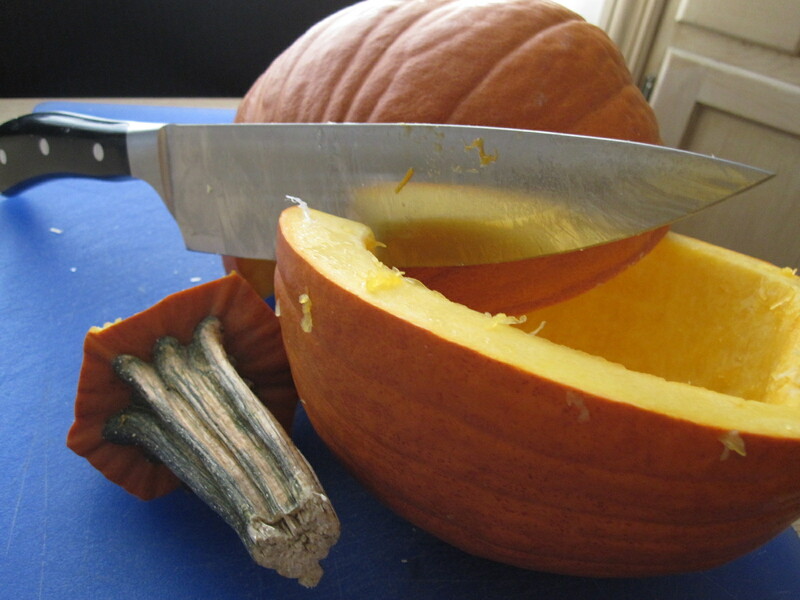 Remove the pumpkin’s lid, and slice the pumpkin in half. Scoop the seeds and strings out well with a spoon; discard. Brush the cut side of the halves with olive oil and season with salt and pepper. On a foil lined cookie sheet, place the pumpkin cut-side down and cover with a sheet of foil. Roast until tender when pierced with a fork – about 1 hour. When cool enough to handle, scoop the flesh from the pumpkin, and puree in a food processor. This can be done in advance and refrigerated. Over medium heat, add 2 tablespoons olive oil, the shallots, and sage, and cook until golden and sweet. Add the pumpkin puree and heat through. Season with salt and pepper. Stir in the molinari. In another sauce pan over medium heat, add the butter and garlic clove. When the butter is melted, add the flour and whisk until smooth. The butter and four mixture is a roux, which is a thickening agent. Cook the roux for about 5 minutes, and remove the garlic. Whisking constantly, add roughly 1/3 of the milk – continuing to whisk until the mixture is smooth again. Once smooth, add the remainder of the milk and continue whisking occasionally until the sauce starts to bubble. At that point, the sauce is as thick as it will get. Remove the pan from the heat and add the cheeses while stirring to melt them. Check the sauce and season with salt and pepper. In a 9 inch by 13 inch casserole (2 inches high), butter the bottom and sides well. Add approximately 1 cup of the sauce and distribute evenly. Add two sheets of lasagna to cover. Spread half of the pumpkin mixture evenly. Top with 1/3 of the fontina cheese, and about 1 tablespoon of parmesan. Drizzle over about 1 cup of the sauce, trying to make it as evenly distributed as possible. Add another layer of pasta, then the remainder of the pumpkin, another third of the fontina, and another tablespoon of parmesan. Drizzle again with about 3/4 cup of the sauce. 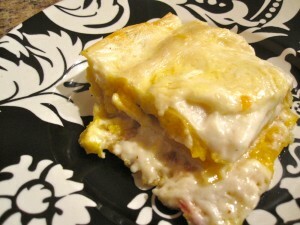 Top with the last two sheets of lasagna, and then spread the remaining sauce on top. Sprinkle the remaining cheese over the top. Tent with tin foil, being sure to fold the foil lengthwise first so it doesn’t dip into the sauce when you put it on the pan. Bake at 350º for 40 minutes. Take the foil off and bake for 15 minutes more. Allow the lasagna to rest 15 minutes before serving so that it maintains its shape.